Interesting debut fantasy novel by Kim J Cowie. The ruthless Virnal Order rules over the Empire of Satine by fear, guile and an iron hand. Lethal poisons from a past cataclysm are leaking from the ground, causing sickness and death. Unseen insurgency seeks to overturn the established order. Cadet Starsin only ever wanted a simple life, pursuing his own selfish interests, maintaining a mistress and adding to his meager army pay by trading in ancient artifacts. But when he witnesses the cold blooded murder of a much admired officer by Virnal enforcers, Starsin feels impelled against his instincts to protest. This marks him down as a trouble-maker and potential rebel. Implicated in sedition, and with both the Virnals and a mysterious adventuress named Lannaira Hajan taking an unhealthy interest in him, Starsin’s mundane life is turned upside down. 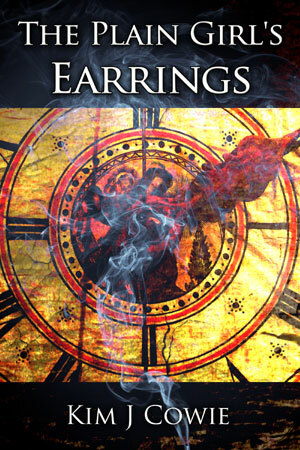 His own ambiguous past threatens an explosive revelation. Take a journey across a troubled land with Starsin, as he battles the Virnals, uncovers shocking secrets and finds that he is not the man he thought he was. The anime and manga databases are working again. Links were still pointing to the old database after an upgrade, and after a while the service provider removed the old one. I have a complete set of the large format New Worlds – #173 to #200, which were published from 1967 to 1971, so I was particularly interested to see a book about the magazine and its art. Michael Moorcock took over editorship of the science fiction magazine New Worlds in 1964, and began changing it from a genre SF magazine to a ‘new wave’ magazine of “speculative fiction.” In 1967, Moorcock obtained a modest Arts Council grant that enabled him to change the format from a paperback to a monthly magazine with half-tone reproduction. Both Michael Moorcock and leading contributor JG Ballard knew Paolozzi personally, and were interested in modern art, as were other people who worked on the magazine. The purpose of changing to a larger format was to include art that complemented the radical fiction content of the magazine. Paolozzi’s science-fiction tinged art was thought to mesh with this. In the event, very little of Paolozzi’s art appeared in the pages of New Worlds (there was a review article about his work in #174, and an illustration in #178), but he was listed as ‘Aeronautics Adviser’ and was clearly an influence. 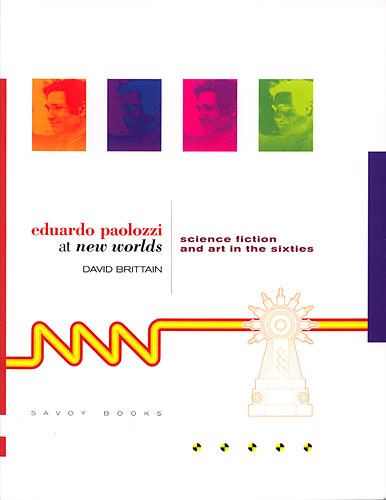 It places Paolozzi’s ‘science fiction’ art of the late ’60s in the context of the new SF and offers fresh insights into the way images and a fragmentary, collages approach to writing informed the controversial prose of Ballard, Moorcock, Brian Aldiss, Norman Spinrad and others. The book contains rare and unseen images from the archives of New Worlds and the Eduardo Paolozzi Foundation, together with excerpts from what is thought to be an unpublished science fiction novel by the artist. There are also new interviews (by Brittain) with Moorcock and key members of his circle about the magazine and others. The book contains many illustrations in monochrome and colour, including many colour images from Paolozzi’s ‘Moonstrips Empire News’, and most of the New Worlds covers from this period. Footnotes and bibliography are included. David Brittain is a senior lecturer at Manchester Metropolitan University. If you are interested in Paolozzi’s science-fiction inspired art and his influence on the magazine, or merely in this exciting period of the magazine’s history, this is a book well worth acquiring. Blu-Ray – worth the money? Is Blu-Ray worth the money? If you’re asking UK fans of Japanese animation, the answer seems to be a resounding “no”. You need only look at the shelves, and when I asked an assistant at a major store, he confirmed that sales of BD anime were very low. Why? Possibly because there’s not much point having a BD if you’re going to play it on a 19″ 720p TV in your student bedroom. And then there’s the patchy availability of titles. I got a BD player along with my HD TV with the intention of buying BD instead of DVD in the future, but that was over a year ago, and the number of BD titles I have been able to buy remains very small. In several cases I was balked because the title of interest was not issued on BD at all, or only as a region A. One had the region annoyance with DVDs, but in that case the answer was to order a player modified to play all-regions. Problem solved. Unfortunately this just isn’t possible with BD players. All is not lost however, and there seem to be several ways around the problem, none of them particularly satisfactory. Some models of player, now discontinued but still available second-hand or ‘reconditioned’ could be altered quite easily to region A or ABC, usually by the expedient of downloading the firmware for another region version of the player and installing it. (The catch is that if you are foolish enough to connect the player to the Internet, it may self-update its firmware…) You could order a new ABC or region-free player, possibly hacked and definitely premium-priced. You could import a new player from the region of interest, in addition to your locally bought BD player. There are two problems with this: the high cost of carriage, and what to do if it goes wrong. Then there is the PC. If you have a recent model PC capable of handling 1080p HD, and with a BD-ROM drive in it, this will play BD disks of your local region, and apparently some easy software hackery will allow it to play BDs from any region. If you already have such a machine stood next to your TV, that looks like the best way to go. If you install a current version of the uTorrent bittorrent client, be very careful with what you select during installation as it’s designed to catch you out and ensure that you install the uTorrent Toolbar and something called Conduit Search, which will thereafter appear all over all your web browsers. Should you want to uninstall all the extra junk (which does who knows what), you’ll find that there is no Uninstall button and you have to do it the hard way. The same or similar remarks may apply to other bittorrent clients. Reproductions of his works can be found online. Kenwood VR-209 remote not working – fixed! Today I fixed a long-standing fault in my Kenwood AV amplifier. I was sure the remote control was faulty, but then I found that there is a known common fault with Kenwoods: the infrared sensor (behind the right end of the display viewed from front) develops a dry-joint caused by thermal movement of its 3 legs. The cure is to take the lid off the case and re-solder the sensor legs. You can prove the fault by poking the area with your finger, whereupon the R/C will probably start working. London W1F 0DR – that’s in Soho.